Our expertise in creating custom voice prompts ensures that our clients get the absolute best recording solutions for their company’s telephone system. Offering affordable voice prompts with a quick turnaround time, Amazing Voice ensures that your corporate image is successfully represented by a professional voice talent that sounds perfectly in-tune with your business goals. We have been producing telephone voice overs for thousands of companies worldwide – from small “Mom & Pop” shops to the biggest International Fortune 500 companies. Our voice prompt files are mastered in our professional recording studios and are optimized to be consistent and compatible with any phone system; be it VOIP, Virtual PBX or hardware PBX unit. We offer Voice Prompts for just about any imaginable situation; Voice Overs for Auto-Attendants, Virtual Receptionists, Voice Mail, Announcements, Message on-Hold, Phone Greetings, IVR, Marketing Messages and More . All audio files are delivered in the format you need. And with a simple click of a mouse - you can download your recordings. It’s that simple! Communicate... your message clearly and effectively to your clients. Professional Voice Talent... to broadcast your message elegantly and with finesse. Quality... produced in our state-of-the-art recording studios. International Languages... to service the most frequent requests among global call centers and companies today. Format... available for any application. We can also convert to most audio formats in existence. Simple... Step by Step process; just fill out the order form and let us worry about the rest. Secure... hassle-free purchase with your favorite credit card via our (SSL) online store. Turnaround... is quick. Within 4 days. (For small to medium sized orders). Delivery... One simple click to download your “ready to use” recordings from your account. Guaranteed... to your satisfaction – 100% – or we will redo your files. 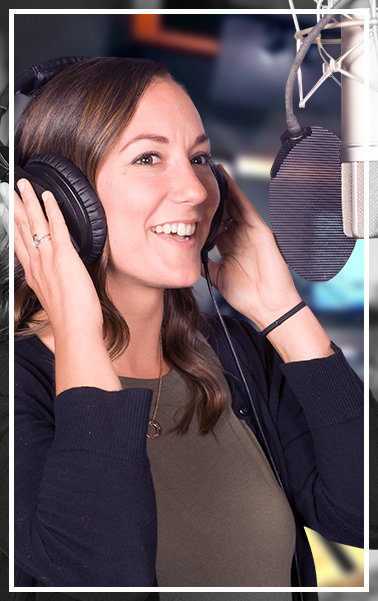 With our large roster of professional voice talent, we make it our mission to deliver the very best in voice prompt recordings available anywhere. Click here to check out hundreds of rave reviews from our satisfied customers. "Hi! Thank your for IVR, everything is OK. We had a pleasure to work with you! "